Hi everyone! Welcome to the Adoring You SOA Collection Blog Hop! You should have arrived here from Ilina's blog. The complete list is below if you get lost along the way. The collection goes up for sale on January 9th at 9am to those on the Wait List. My first card features a sentiment from Happy Together stamp set and a creative way to use the Adore Die. I die cut the Adore die twice using white card stock. I trimmed off the top portion of the die on both pieces. I then rotated one of the die cut pieces and placed it over the other piece. This creates a fun plaid pattern. So cool, right?!!! I layered this onto a piece of black card stock to help it stand out. I then stamped the sentiment once using Limoncello & Samba ink and then again using Midnight ink. I used the coordinating die to cut them both out and then on the Midnight one I fussy cut the love out and glued it over top the colored sentiment. Easy peasy!!! My next card features the adorable birds from the Happy Together stamp set & the Love Note Background stamp. I started my card by stamping the Love Note Background stamp onto my card base. I only inked up one side of the stamp because I new I was going to be covering most of it. I then stamped the branches, leaves, buds & sentiment onto my card piece. I stamped and die cut the birds and mounted them onto the card front using dimensional adhesive. I attached a small strip of black card stock to the stamped panel and adhered it to my card base. It's time now to start hopping along, BUT before you go, make sure you leave comments on each stop along the way for your chance to win! Your next stop on the hop is Tracie Pond! 2 random winners will be chosen to win a $25 Gift Certificate to the shop and will be announced on Jan. 14th on Catherine's blog. That adore die is going to get a lot of use! These are both gorgeous, Kristie - I love the pops of colour against the black! Those birdies are especially fabulous! Great cards, those birds are so stinking cute. Love how you used the adore die. The way you used the Adore die on that first card Kristie is incredible!!! And then that second card - gorgeous!!!! So interesting, love all the cards! Great cards, Kristie! Love the little birds in the 2nd card but also love how you used the Adore die in the first! Thanks for sharing. I love the pops of color with the black and white. Makes your cards stand out! Great cards! Love the plaid look with the Adore die. Love them both. So Kreative! Love how you used that die. Clever way to get the plaid design. card plain was a great idea. Saw these on Catherine's reveal and loved them. LOVE your crafty moves using the ADORE DIE! Sweet outcome!! I just love the colorful birds on the gray and white background. This makes them really stand out! Wow!!! I love these cards! Great use of the stamps and dies! Love the layouts of them both. Love your color blend on the birds! Just beautiful! Love the plaid. And being a birdie lover, adore that sweet card. And the colors you used for those sweet parakeets (that's what they remind me of anyway). I love how you made that plaid in the first card. How inventive! Beautiful cards Kristie!! :) I especially love what you did with that die in order to get a 'plaid' effect!! Very ingenious!! :) Thanks for sharing!! Love the brightly colored birds! So fun!! Love the dimensional black and white plaid. It almost looks woven. And your beautiful love birds just pop on that elegant B&W setting. Such great ideas! Beautiful cards Kristie! I love all the colour on your birds! Love both of these! I'm trying to figure out how you did that "plaid" with the die! It's so creative! What's not to adore about the adore die? It's so versatile! I love your bird card - how the birds just POP on the B&W card. And the Adore die? that's fantastic! Oh my Kristie, those birds are gorgeous. And what a fun way to use the Adore die! 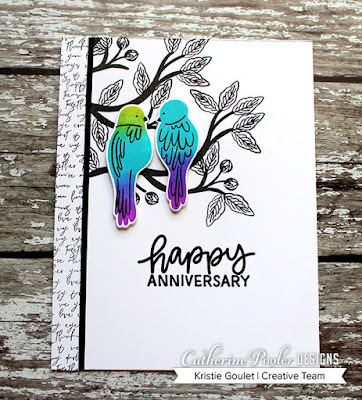 Love the way you colored the birds on your card! Really love bold and bright! Beautiful card. I really like the background stamp peeking out and your colors for the birds are awesome!! Absolutely love the birds in tree. Terrific job! Both cards are fantastic! Love the birds. Great cards! I love what you did with the Adore die. So creative! Wow! Two super cut cards. I'm so attached to that darn script background already. Super gorgeous Kristie!! Love the multi colored birds - how did you do that ! Your use of the Adore die has blown me away!! The birds are so colorful and gorgeous! The patterned background is a cool idea. 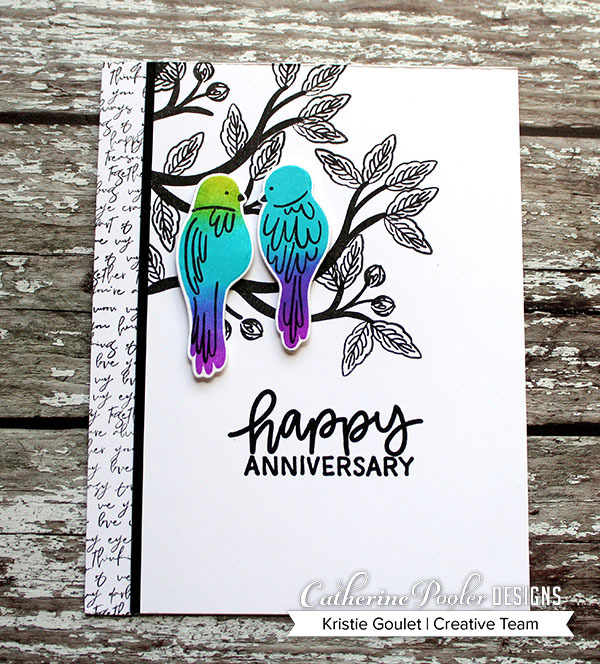 I just love your bird card with the branches - so fun! What a lovely pair of cards Kristie - love your 'plaid' background, such a creative way to use the die cut, and so dramatic with the white on black! Love how you made the background with the adore die! Gorgeous cards! Love the colors you used on the little birds! Beautiful cards, Kristie. Anxiously waiting ti receive my collection!! Kristie, your cards are always so stunning. Thankyou for inspiring us once more. Absolutely gorgeous cards, Kristi! Really amazing collection and have to say those little birds are so cute and love the color combo's. Thanks for sharing. I love the bright pops of color! Gorgeous cards, Kristie. So bold and beautiful! The bright colors are so cute! thank you for sharing. love how you made that 1st card. I love those birds. They look so wonderful against the background branches. Good Job! Kristie that 1st card is absolutely fabulous. the die cut panel makes the bird s just leap off the card. Loving the black and white! And the pop of color! Beautiful cards Kristy. I love the plaid design you made with the die cuts. You are so clever. You are so clever! The cards are great. Love how you colored the birds! Both cards are terrific. 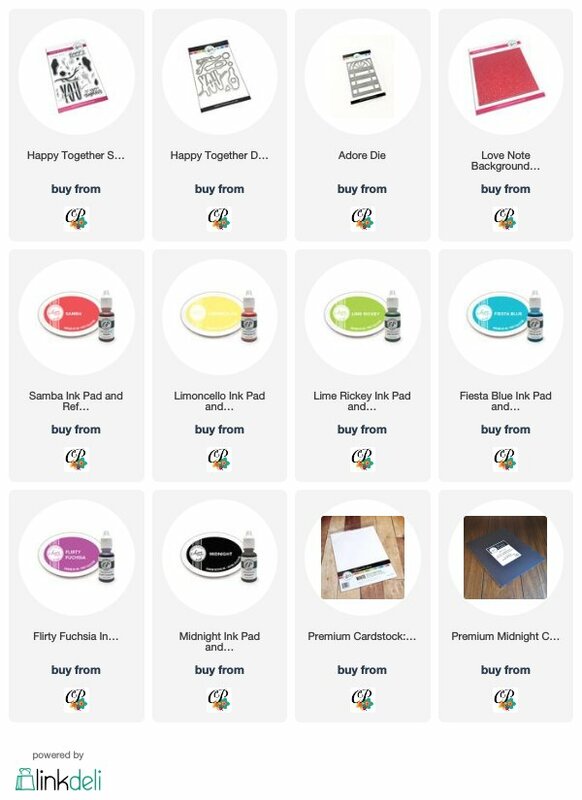 These are beautiful, love your use of color Kristie! I am in love with those birds! They are so bright and colorful! Beautiful cards! I love those sweet birds! Love how your colors pop from the black and white! Gorgeous! Creative design on the first one and love the birds. Kristie I always enjoy your cards. I am so drawn to the plaid background. Beautiful cards Kristie! I love the pops of color.